Amphiprion leucokranos Allen 1973, the White-Bonnet Anemonefish. (*A nomen nudum, non-species cross between A. chrysopterus and A. sandaracinos). Has a large tear-drop white mark on head and patch on side of head. To three and a half inches length. This one photographed at the Texas State Aquarium, Houston. 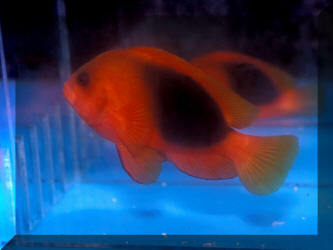 Amphiprion sandaracinos Allen 1972, the Yellow or Eastern Skunk Clownfish. Indo-West Pacific; Christmas Island and Western Australia in the eastern Indian Ocean to the Ryukyu and Solomon Islands in the western Pacific. 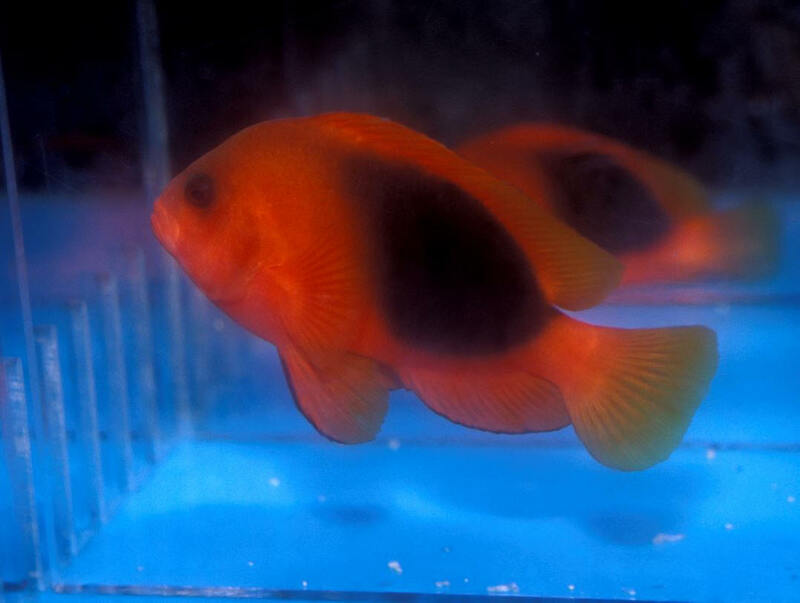 Note the orange body color and wide white stripe that extends down to the upper lip, differentiating this from other "Skunk Clowns". One in Wakatobi, S. Sulawesi. 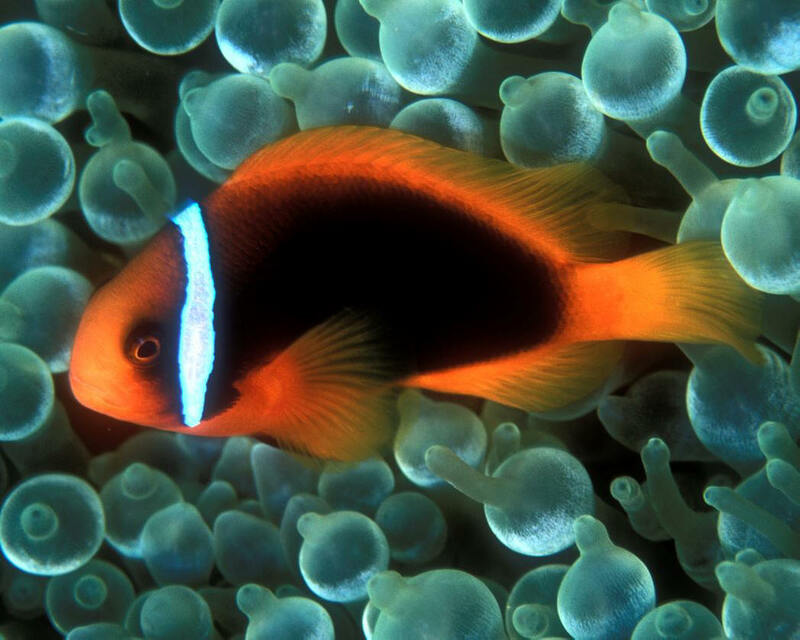 Amphiprion ephippium (Bloch 1790), the Red Saddle Anemonefish. Eastern Indian Ocean; Andaman and Nicobar Islands, Thailand, Malaysia, Java and Sumatra in Indonesia. To five and a half inches maximum length. This one at Quality Marine in Los Angeles, CA. 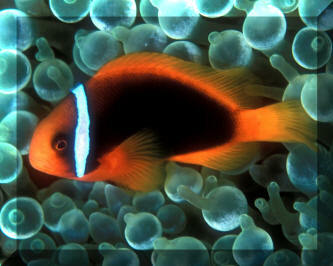 Amphiprion frenatus Brevoort 1856, the Tomato Clownfish. Found in several island groups in the Western Pacific. To five and a half inches in length in the wild. This one in Pulau Redang, Malaysia with a Bubble Tip Anemone, Entacmaea quadricolor which the species most often pairs with. Similar to A. melanopus, but with a narrower white head band.